The Greenman Bushcraft Fire Whistle is a fantastic little survival accessory that should form part of all modern survival kits - it's flat, lightweight, wearable and essential in a survival situation, so why not add one to your survival tin, prepping pack or bug out bag? 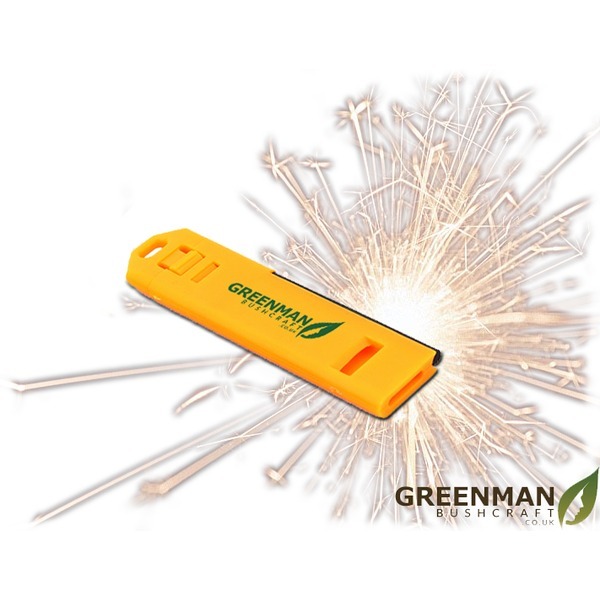 They're very easy to use, and will allow you to light fires and signal for help with ease. 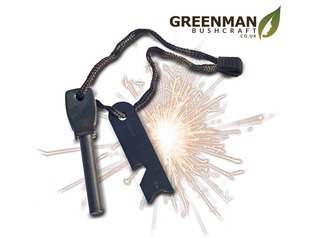 The Greenman Bushcraft Fire Whistle is compact and will easily store inside a survival tin, pocket, and wallet, bug out bag, prepping kit or if you attach a lanyard, you can wear it around your neck for quick and easy access. 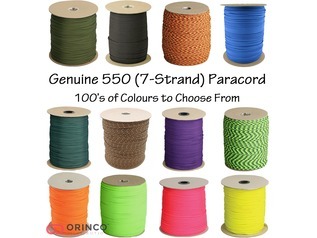 The colour is nice and bright, so if you drop it when you need it the most, it will be far easier to find than if made from muted colours, such as black or green. 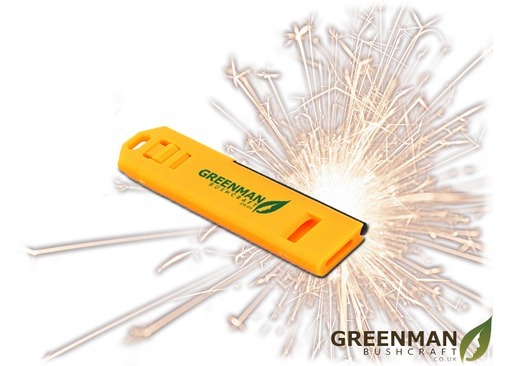 Weighing in at 10 grams, and measuring just 79mm long, 21mm wide and a mere 5mm thick, the Greenman Bushcraft Fire Whistle is the perfect solution to your fire lighting and emergency signalling needs. The top section removes easily from the body to reveal a tiny steel striker, which once dragged across the surface of the firesteel will produce a hot shower of fire lighting sparks, which when used with a tinder bundle will create a fire with barely any effort at all! On the other end of the Greenman Bushcraft Fire Whistle is a high-pitched emergency signalling whistle. If you'd like to wear the survival tool, then that is no problem either, thanks for the lanyard hole on the striker part of the device - simply add some paracord. If you are looking for a small, low-cost and reliable survival device that allows you to light fires for warmth and cooking, as well as allowing emergency signalling, then our new survival accessory is just for you! 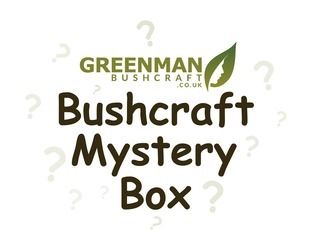 Greenman Bushcraft offer this product on both a retail and wholesale basis, so if you'd like to stock them in your shop - simply drop us an email and we will be sure to help you out. "Great item! Bright, slim, loud and the added bonus of a detachable striker that sends sparks flying. Very pleased with this, will order more for my scout group. Actually easy to use as a fire steel, so ideal to use as a teaching tool. Fits neatly on a lanyard." "My daughter took mine on her D of E expedition, canoeing on Scottish lochs and around the coast, louder than the one it replaced and her team mates were impressed with its range. 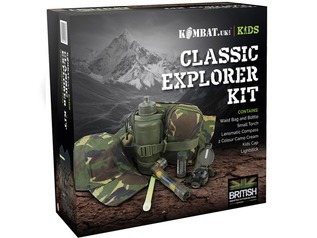 The striker was a useful bonus whilst wild camping." "Tiny, but effective. Very slim, fits nicely on my key ring. Striker attaches firmly, but removes easily. Lit tonight's fire easily without any hassle. 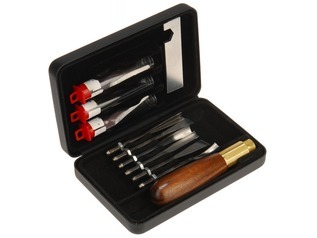 Excellent value & will order a few to keep handy next time." "Great little product. Very compact, but excellent quality, both whistle & firesteel work well. Scraper is good too & attaches firmly. Ideal to wear on a lanyard around your neck & at this price have one in a pocket of every jacket. Next time I order, I shall buy half a dozen." "Handy item. I keep it in my pocket. There are plenty of sparks. I haven't tested the whistle to it's fullest yet. For the price I'm going to get a few to keep in various places. " "Excellent quality with a loud clear tone to the whistle and good hot bright sparks from the firesteel. 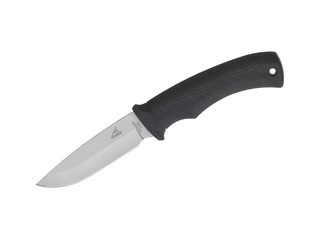 Light weight compact and easy to use with the effective steel striker."